Where’s This “3 Months Off” I Hear Good Things About? Just got back from a short vaca on the west coast, where I left the 100 degree temps of Las Vegas for the 100 temps of Philadelphia. Yey humidity! I’m spending the morning catching up on e-mails and twitter and other silliness, when it occured to me that my summertime is quickly eroding into nothingness. Lots of great math professional development yet to come, and scads of math and science folks to meet and connect with! 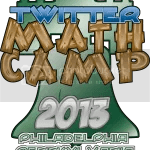 Next week is Twitter Math Camp at Drexel University. This is the second year for TMC, but my first time attending. 125 math educators from around the country, having bonded online through Twitter and blogs, will converge on Philadelphia to share ideas, lessons and experiences. I’m looking forward to meeting many of the folks I have communicated with and stolen ideas from through Twitter and their blogs. While I often like to volunteer and share at conferences, this is one where I am content to participate and learn. You can find out more about many of the folks attending through the mathtwitterblogospehere page. Follow the hashtag #tmc13 to check in on the action from July 25 – 28. From August 3-9, I am back for a 3rd year with the Siemens STEM Academy, held at Discovery Education HQ is Silver Spring Maryland. Thanks to Kyle, Mike and the Discovery Education gang for having me back for another summer of STEM fun! I’m glad that my colleagues have begun to enjoy the great works of the math blog world, and looking forward to more learning! So, to my non-teacher friends, neighbors and family. Ask me again how I am enjoying my summer off…..you may want to take a step back or suffer a quick kick to the shins!